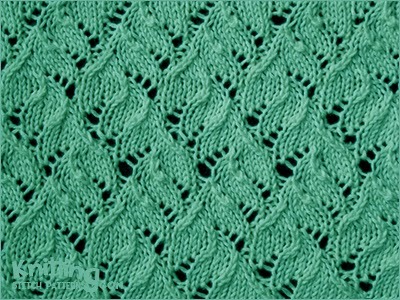 Pattern to knit in the round. Round 1: * Ssk, k7, yo, p1; repeat from * to end of round. Round 2: * Ssk, k6, yo, k1, p1; repeat from *. Round 3: * Ssk, k5, yo, k2, p1; repeat from *. Round 4: * Ssk, k4, yo, k3, p1; repeat from *. Round 5: * K3, k2tog, k4, yo, p1; repeat from *. Round 6: * K2, k2tog, k4, yo, k1, p1; repeat from *. Round 7: * K1, k2tog, k4, yo, k2, p1; repeat from *. Round 8: * K2tog, k4, yo, k3, p1; repeat from *. Round 9: * Yo, k3, k2tog, k4, p1; repeat from *. Round 10: * K1, yo, k2, k2tog, k4, p1; repeat from *. Round 11: * K2, yo, k1, k2tog, k4, p1; repeat from *. Round 12: * K3, yo, k2tog, k4, p1; repeat from *. Round 13: * Yo, k7, k2tog, p1; repeat from *. Round 14: * K1, yo, k6, k2tog, p1; repeat from *. Round 15: *K2, yo, k5, k2tog, p1; repeat from *. Round 16: * K3, yo, k4, k2tog, p1; repeat from *. Round 17: * Yo, k4, k2tog, k3, p1; repeat from *. Round 18: * K1, yo, k4, k2tog, k2, p1; repeat from *. Round 19: * K2, yo, k4, k2tog, k1, p1; repeat from *. Round 20: * K3, yo, k4, k2tog, p1; repeat from *. Round 21: * K4, ssk, k3, yo, p1, repeat from *. Round 22: * K4, ssk, k2, yo, k1, p1; repeat from *. Round 23: * K4, ssk, k1, yo, k2, p1; repeat from *. Round 24: * K4, ssk, yo, k3, p1; repeat from *. Cast on a multiples of 10, + 1 sts and 24-row repeat. Row 1 - right side: P1, * ssk, k7, yo, p1; repeat from * to end. Row 2: K1, * p1, yo, p6, p2tog-b, k1; repeat from * to end. Row 3: P1, * ssk, k5, yo, k2, p1; repeat from * to end. Row 4: K1, * p3, yo, p4, p2tog-b, k1; repeat from * to end. Row 5: P1, * k3, k2-tog, k4, yo, p1; repeat from * to end. Row 6: K1, * p1, yo, p4, p2tog, p2, k1; repeat from * to end. Row 7: P1, * k1, k2-tog, k4, yo, k2, p1; repeat from * to end. Row 8: K1, * p3, yo, p4, p2tog, k1; repeat from * to end. Row 9: P1, * yo, k3, k2tog, k4, p1; repeat from * to end. Row 10: K1, * p4, p2tog, p2, yo, p1, k1; repeat from * to end. Row 11: P1, * k2, yo, k1, k2tog, k4, p1; repeat from * to end. Row 12: K1, * p4, p2tog, yo, p3, k1; repeat from * to end. Row 13: P1, * yo, k7, k2tog, p1; repeat from * to end. Row 14: K1, * p2tog, p6, yo, p1, k1; repeat from * to end. Row 15: P1, * k2, yo, k5, k2tog, p1; repeat from * to end. Row 16: K1, * p2tog, p4, yo, p3, k1; repeat from * to end. Row 17: P1, * yo, k4, ssk, k3, p1; repeat from * to end. Row 18: K1, * p2, p2tog-b, p4, yo, p1, k1; repeat from * to end. Row 19: P1, * k2, yo, k4, ssk, k1, p1; repeat from * to end. Row 20: K1, * p2tog-b, p4, yo, p3, k1; repeat from * to end. Row 21: P1, * k4, ssk, k3, yo, p1; repeat from * to end. Row 22: K1, * p1, yo, p2, p2tog-b, p4, k1; repeat from * to end. Row 23: P1, * k4, ssk, k1, yo, k2, p1; repeat from * to end. Row 24: K1, * p3, yo, p2tog-b, p4, k1; repeat from * to end. K2tog: Knit 2 sts together | Ssk: Slip slip knit. P2tog: Purl 2 sts together | P2tog-b: Purl 2 sts together through back loop.